It's something that most players wouldn't even think is possible: playing a game in a certain way that jumps you completely to the end, without beating its final battle. But there it is, just executed in Super Mario World. In addition to his speedrunning, SethBling is someone already known for an impressive depth of knowledge in the Minecraft world. 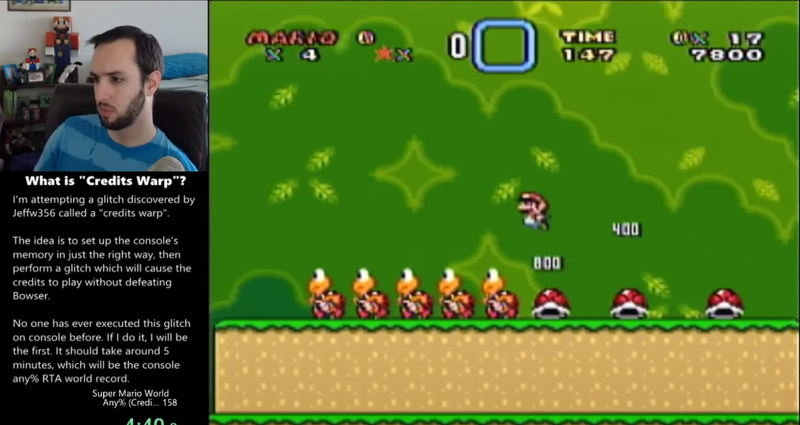 The amount of knowledge needed to suss out this glitch and the exacting nature of its execution (discovered by Twitch streamer JeffW356 and explained in depth here) is simply incredible. It shows off just how important the work of speedrunning and hacking/modding communities can be insofar as opening up the possibilities of what's able to be done with video games. You need to know how the game was written and the effect that player actions have on the way that the console and the game talk to each other. Note: SethBling's pulled off an even faster time of 4:49.8 with the glitch, making it an incredibly fast completion performance for SMW.